There are few feelings that are as tumultuous and difficult to process as heartbreak. We are never sadder and at our most defenselessly defeated as we are when we’ve lost love, and knowing that we’re not alone out there can make all the difference in the world when it comes to getting through the storm of emotions we have to endure. Reaching out through the darkness with a bursting light of hope is Project Grand Slam, whose new song “Lament” brilliantly captures the essence of what it feels like to have loved, lost and become a little wiser for the wear in the process. I’ve been a big fan of this group and its frontman Robert Miller for a while now, but I must say that this is probably the best work I’ve personally heard them put together. In a spellbinding marriage of jazz chaos with soulful, polished pop melodies, “Lament” shows off some of the most nimble, precise instrumentation of any song on the charts today, and it conveys its message of contemplation with a poetic drawl that is all at once unforgettable and jarringly vulnerable in the same breath. It takes a special kind of artist to be able to have command over your audience at every single level of your medium: casually sampling a new album through a pair of headphones, experiencing all of the unstoppable energy of their live stage show, witnessing their creative reach expand into multimedia and video. Sure, most professional musicians are at least able to nail one of those things down before they cut their first record, but how many are proficient at all three, and consistently able to put out music with the same zeal as their rookie work? Few, maybe none. Project Grand Slam isn’t just a great source for hot tracks, but they’re a downright rare occurrence in this business. Music that boils under the surface of mainstream airplay and exposure is often some of the best music that you’ll ever discover in your life, because it doesn’t owe anything to anyone or have to live up to anyone’s expectations. You can’t rush perfection, but you also can’t pretend like it’s attainable when there’s nothing meaningful there to pursue. 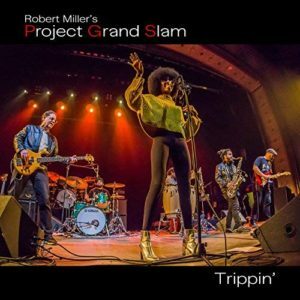 Project Grand Slam exist in the space between superstardom and total obscurity, and I feel like that adds to the mystique and indie allure of their music. This is music for people who put a lot of stock in compositional and production values. It’s intellectual and surreal, but it is anything but snobby or elitist. How they managed to make something like this and not come off a little cocky or conceited is a miracle in itself, but I don’t feel like there’s really anything to pick apart in the approach that was employed with “Lament” or anything else on Project Grand Slam’s upcoming record Trippin’. My recommendation is this: let’s sit back and enjoy what this group of artists is giving to the world right now. It might be a long time before we get the chance to hear this kind of enchantment in one place again.